I live north of Geneva. Sometimes on my way home to avoid traffic lights I drive up Sherrill Street to North Genesee Street and on over to Route 14. I’m always impressed by the various styles and sizes of the houses. It’s a street that has retained many of its trees, once common in the city’s old neighborhoods. While not stated in the newspapers, the street was named for Colonel Eliakim Sherrill from Geneva. He organized the 126th New York State Infantry during the Civil War, died at Gettysburg, and is honored with a monument in Washington Street Cemetery. The earliest information we have for Sherrill Street is the 1894 village directory. Streets are rarely developed in a logical pattern, beginning at one end and finishing at the other. By 1894 there were only six houses on the west side of the street, none on the east, and they were spread out. 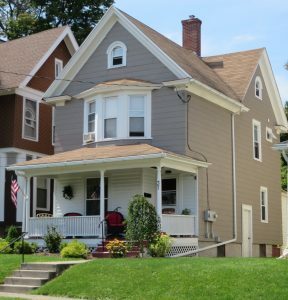 By 1897 there were three houses on the east side in the center of the street. 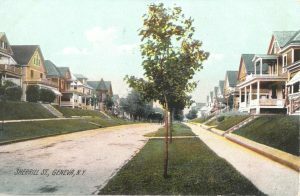 In the 1900s the street developed until all lots were occupied. In 1894 the jeweler Joseph Worth, number 19, was the only house at the south end of the street. Of the five other 1894 homeowners, two had no occupations listed in the directory, one was baggage master for the New York Central Railroad, and another was an engineer. The last one, at number 71, was James R. Vance, foreman for the New York Central Iron Works. Within a few years he began the Vance Boiler Works which is still in business today as Vance Metal Fabricators. Between 1894 and 1899 the street followed a pattern set by these first few houses. Homeowner occupations included bookkeeper, commercial traveler (sales representative), and machinist. These were positions of skill, responsibility, and enough income to purchase a substantial home. It’s hard to estimate personal wealth of 120 years ago but there were a few business owners on the street. Edson Granger, number 37, owned a steam laundry on Main Street. Adam Emig, number 70, owned a heating and plumbing business on Castle Street and sold boilers made by his cross-street neighbor James Vance. 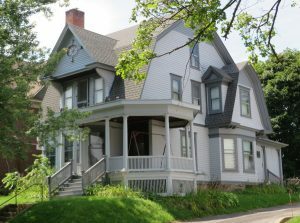 While many of the homes are solid gable-front or cross-gable designs, there are two more elaborate houses that always catch my eye. C.E. Turner was a contractor so he may have built this Queen Anne-style house at number 51 for himself. 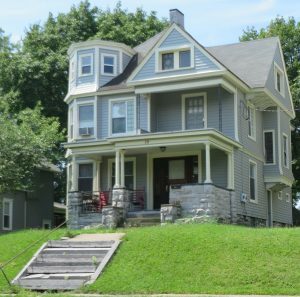 A corner tower, wrap-around porch, and upper-story porches were features of this style. Nurseryman Chauncey Sheffield was the first owner of number 55 in 1903. 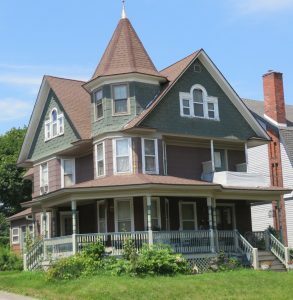 This style is harder to describe with elements of Queen Anne and a Dutch Colonial Revival gambrel roof. Mr. Sheffield may have been inspired by Mr. Turner’s house next door, or may have selected the house from a pattern book. 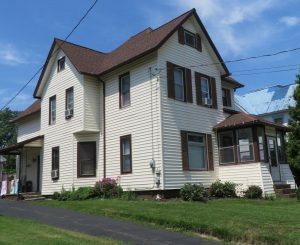 There are more houses and stories on Sherrill Street. The next time you’re heading to Torrey Park, take a slow drive up the street and look for yourself. Great story thanks!! One thing you didn’t mention was the very large rooming house that stood on the east side north corner across from the Lehigh station! I stopped at Avenue C – the Lehigh station and buildings around it may be its own blog. We have good postcards of the station and I think photos of the building you mentioned. Thanks!